We’d love your help. Let us know what’s wrong with this preview of Building the Benedict Option by Leah Libresco. Beginning when the author was a new convert, she desired more communal prayer and fellowship than weekly Mass could provide. She surveyed her friends--busy, you Building the Benedict Option is a combination spiritual memoir and practical handbook for Christians who want to build communities of prayer, socialization, and evangelization in the places where they live and work. Beginning when the author was a new convert, she desired more communal prayer and fellowship than weekly Mass could provide. She surveyed her friends--busy, young, urban professionals like herself--and created enriching or supportive experiences that matched their desires and schedules. The result was a less lonely and more boisterous spiritual and social life. To ask other readers questions about Building the Benedict Option, please sign up. A full book of Leah doing what Leah does best: bringing the deeply meaningful to the practical level, and teaching how to make practical suggestions deeply meaningful. And she doesn't just give logistical suggestions; she knows that she's somewhat idiosyncratic, so she illuminates the *principles and questions* upon which she has coalesced little local communities to empower the reader to design his own intimate, faithful community. Creating a social movement is hard. Creating a social movement of conservatives is even harder, since for the most part progressives derive much of life’s meaning from social action, while conservatives just want to live their lives. For three years now, Rod Dreher has rung the alarm bell of his Benedict Option, warning that the hour is late, and Moloch is within the gates. Many are listening and receptive, even eager. But the Benedict Option faces challenges, of which the first is inertia, sinc Creating a social movement is hard. Creating a social movement of conservatives is even harder, since for the most part progressives derive much of life’s meaning from social action, while conservatives just want to live their lives. For three years now, Rod Dreher has rung the alarm bell of his Benedict Option, warning that the hour is late, and Moloch is within the gates. Many are listening and receptive, even eager. But the Benedict Option faces challenges, of which the first is inertia, since conservatives find it hard to act to change their lives when not directly impelled. In response, Leah Libresco here outlines an excellent plan to overcome that inertia. When I first started writing this review, I thought I would discuss as well as second challenge—the enemies of the Benedict Option. But after thought, it is not quite correct that enemies are a challenge that will rise to meet the Benedict Option. It is more accurate to say that virtue and goodness have enemies and the Benedict Option will be one of their targets, since it is one, but only one, manifestation of virtue and goodness. Therefore, defending virtue and goodness as a whole is necessary to protect and carve out space for the Benedict Option, and to allow all people to flourish. That is, the Benedict Option is necessary, but not sufficient, in the declining West. It must be coupled with a twin power, externally focused to complement the Benedict Option’s primarily local focus. But first, let’s talk about Libresco’s book. As many people don’t understand, or choose not to understand, Dreher’s Benedict Option has nothing to do with “heading for the hills,” and everything to do with building thick local communities of Christians in order to resist liquid modernity. The people forming these local communities are not planning to move anywhere, and they are not cutting off their connections to the rest of the world. In fact, if anything, they will probably increase their connections to the rest of the world, to their co-workers, to strangers in need, and to old and new friends. Really, the Benedict Option is an attempt to rebuild, in a different and more resistive form, the old intermediary institutions of society that have disappeared over the past fifty years, but with a specifically Christian gloss appropriate for the age. Libresco is furthering Dreher’s project by giving small-scale, concrete advice how to build such community. Her focus isn’t on all possible versions of the Benedict Option; rather, it’s on what makes sense for younger urbanites, such as herself. Most of her advice revolves around simple gatherings designed for Christians to reinforce their bonds and faith. She addresses administrative challenges and gives sound advice for how and whom to invite, what to offer to eat, how to schedule, and so forth. All of this is done from a Christian perspective, of course, and the presumption is that most invitees will be Christian, but not necessarily all. What underlies all Libresco’s specific plans and ideas is not to let the perfect be the enemy of the good. You have to try different things and see what works for your group and your situation. You can’t get too upset if something doesn’t work, if something ends naturally because some people move away or your group isn’t interested in Shakespeare film marathons. Yes, some of what she suggests won’t apply to everyone; that is not a failing, since this book is not an encyclopedia of all possible Benedict Option implementations, but merely an attempt to get the party started, literally and figuratively. So I think that everyone who has any interest whatsoever in the Benedict Option should read this book, to either apply versions of Libresco’s ideas himself, or to use her ideas as the springboard for fresh variations—and maybe then to write a second book on the topic, or start a blog, or do something. For nothing for nothing, and nothing’s free. Unless people take the first steps, the Benedict Option is just a discussion idea for frustrated Christians, no different than wishing through the bottom of a wine glass that the kingdom of Louis IX return in glory to implement Catholic integralism. Thus, friendly criticism of the Benedict Option such as that leveled by Noah Millman is off base. Millman suggests that advocates of the Benedict Option are not serious unless they take their kids out of public school, create “wealthy, independent institutions from communal property,” and adopt distinctive dress. But right now only small changes, small groups, and the laying of foundations can be expected, not the building of a new Cluny. Bigger changes come after, and it is likely that dramatic change, and real sacrifice, will only become part of the Benedict Option when Christians are driven to it. Very few people tried to flee Pompeii until the pyroclastic flow was upon them. It is probably only when the active persecutions of all orthodox Christians begin (rather than the spotty ones we have now) that the Benedict Option will gain more traction, and actions like wearing distinctive dress seem like the right course. True, such delay is not desirable, for it is procrastination, and procrastination kills. But until that which we fear has come upon us, human nature is to wait a little, wait a little. Yes, some other groups, such as Orthodox Jews, and the Mormons, already adopt practices such as those Millman identifies. This would seem to suggest that orthodox Christians could also now adopt similar practices and structures. But both Jews and Mormons have living memories of extreme persecution; Christians in America do not. They are in uncharted territory, so their procrastination is natural and nearly inevitable. Still, Millman is correct that the Benedict Option, to be robust, will ultimately have to adopt such practices and build such structures. There is no doubt that sort of thing is necessary for real success (which, in short, means the transmission of Christianity and reality-based life through the crash of modernity). Institutions should be the goal, rather than being Christians in the catacombs. But it is not monasteries, physical institutional centers like Cluny, that should be the aimed-for model; the Middle Ages are gone. Probably what is called for, building on the foundations set up by ideas like Libresco’s, is something like a decentralized type of Galt’s Gulch (without the Objectivism), where Benedict Option ideas on a local level are assisted and coordinated by a wealthy mothership through modern communication. But given inertia as the threshold hurdle, if you can’t organize Friday night dinners, it’s a bit harder to imagine ever building an actual, “wealthy, independent institution,” so Libresco’s book matters. Millman is making the perfect the enemy of the good, or, perhaps, insisting on hitting a triple when a base hit will do to start. Let’s get on to enemies. As it stands, to the extent they are aware of it, the Benedict Option is hated by the lords of this world against whose liquid modernity the Benedict Option is designed to defend, just as they hate all orthodox Christians, the more so in degree to their effectiveness in living their beliefs and passing them on to others. But were the Benedict Option to get any traction, if groups such as those outlined in Libresco’s book form widely and begin to form any kind of interlocking movement, and even more so if institutions begin to form, the Benedict Option will start to receive real attention, and not nice attention. The mere existence of any set of virtuous people is a reproach to the ideology of modernity and threatens the Gleichschaltung that is required by the oligarchy of the powerful, the Leviathan, or Cthulhu, state. Even more reproachful and threatening are multiple sets of such people, acting in a way that is coordinated formally or informally. None of that cannot be tolerated, for the only thing that cannot be tolerated is intolerance. It is not merely that intermediary institutions in general are disfavored by the modern state, as threats to its making all people dependent on it. More than that, there can be only one triumphant vision of the world and the teleology of man; matter and anti-matter cannot co-exist. Even a modestly successful Benedict Option will be cast as a threat to the state, which it is, since the state is increasingly the executive branch of evil. Takers of the Benedict Option will be the American Falun Gong, and this treatment will escalate when, as the modern state inevitably cracks in the time of troubles, scapegoats are sought. Attacks on the Benedict Option will be merely a subset of such attacks, though, which will equally be levied on all orthodox Christians, as well as on other groups, especially Mormons, and perhaps on devout Jews and Muslims as well (though there the analysis is somewhat different). Key to understanding the appropriate response, however, is that when this will happen remains to be seen. It is now just a possible future, and today we can still see in embryo all possible futures. Given that calls to send Christians to the lions again are merely aborning—now a baker persecuted here, a few score Apple employees there—time remains to burn off the rot, though Dreher is not wrong, that the hour is late. However great their merit, Libresco’s dinners will not act as the needed cleansing fire—the Benedict Option’s purpose is not to fight, but to carry the light of virtue and goodness through the coming time of trouble. To ensure the vigorous survival of Christianity and Western civilization, intertwined sources of nearly everything that has driven man forward for fifteen hundred years, and to have the best chance of shortening that time of troubles, we must also be prepared to forge a sword, to be placed in the hand of a new creature, fierce Behemoth raised to fight evil Leviathan. I have said much more along these lines in my earlier review of "The Benedict Option" itself; I will not repeat myself here, but you can (and should) go read the review, which has held up well over the past twenty months, I think (you may want to add my relevant thoughts on Carl Schmitt’s writings on enemies, too). Libresco addresses enemies, but only in passing. She quotes one of her attendees, “Of course, whatever we do, the Leviathan State will eventually turn its eye on us and crush us.” Libresco’s response is that “I could grant that was true of the weirdest (and even some of the less weird) BenOp ideas my friends had floated, [such as an underground nurse service or communal living]. . . . But I was darned sure that there were plenty of ways for us to care for each other, pray for each other, and become more like Christ that were way too boring for the state to care about.” The problem with this brush-off is that the Cthulhu state’s objection is not to substance; the state is not interested in parsing “approved” and “not-approved” elements of the Benedict Option. No, while with the Emperor Julian the modern state may find it useful, or even disconcerting, that Christians care for each other, their real objection is to the reproach and threat they pose simply by what they believe, and the specifics of what they do are completely irrelevant. Certainly the Benedict Option on the path Libresco outlines is a great, and necessary, response to the ambient culture. And I am all for such resilient practices and institutions. But they won’t endure what’s to come by their mere existence, and therefore preparation for overt conflict is also necessary. Why, as I say, I outline in my original review, along with what to do about it, drawn in broad strokes, whose precision will necessarily become greater as the day darkens. By “conflict” I mean not merely some form of prickly engagement with the state and the culture that has bred it, though that is certainly necessary, but also preparing for what is likely, violence. The shape of this is unclear and could involve not merely the response of persecuted Christians but a general descent into societal fracture, in which takers of the Benedict Option are swept up, in part for defense and in part helping to remake the world. We’ll find out the details when we get there; it’s present-day mental and physical preparation, in cooperation with Benedict Option principles, that’s the key. As Lenin said, “timing is all,” and with Lenin, our job is to prepare, and be prepared to act, not to wait until some nasty combination of North Korea and Brave New World wholly crushes those opposed to the moral dictates of the Cthulhu state. I readily enjoyed this book. While people are attacking the concept of the Benedict Option, I feel like this book sidesteps that drama and plunges you into the trials and triumphs of actually creating Catholic community. I have spent the majority of my life in parish ministry trying to do just that, so it was refreshing to read such a book. Put prayer at the center of your friendships and you'd be amazed at how the Holy Spirit is unleashed in your life and your parish. This book is such a tonic: cheerful, practical, and encouraging. I generally think Rod Dreher is on track with the Benedict Option, but his book has a tendency to gloom. So this makes a good and welcome companion volume. I love practicing hospitality, and my husband and I have been intentional about offering our home as a place for community to be rooted, so I appreciated Libresco's practical wisdom, both in dealing with others-- there's always that one socially inept person you struggle to love- This book is such a tonic: cheerful, practical, and encouraging. I generally think Rod Dreher is on track with the Benedict Option, but his book has a tendency to gloom. So this makes a good and welcome companion volume. I love practicing hospitality, and my husband and I have been intentional about offering our home as a place for community to be rooted, so I appreciated Libresco's practical wisdom, both in dealing with others-- there's always that one socially inept person you struggle to love-- and with her own limitations. I will admit to being a little concerned, going in, that I wouldn't find much of use here because practicing hospitality and cultivating community as the mother of six children means I operate under significantly different exigencies. Before I had children myself, I was blind to those exigencies. I'm sure, looking back, that I was in my cluelessness deeply inconsiderate of my friends who had small children. Libresco seems free of that, though-- one of her charms is her humility and intention to consider others' lives rather than just doing what works for her. I wish I'd had that level of wisdom and caritas when I was in her life stage. The final chapter alone is worth the price of the book, especially the portions on running to God and the special love that characterizes (or ought to characterize) Christian communities. I really enjoyed this book as a companion to Rod Dreher's The Benedict Option. If the Benedict Option is the treatise on the what, this is a book on the how. Leah's style is easy to read and follow and she offers plenty of personal examples to illustrate her "Little Way" of the Benedict Option. I very much recommend this book for those interested in fostering more Christian community. A BenOp book with nary a “head for the hills” vibe. It’s much less about escaping than it is about the value (and how-tos) of Christians being meaningfully present to one another on a day to day basis. The author is a young professional but I found her suggestions quite relevant for families, too. It’s a good mix of practical suggestions and insightful reflection. I especially appreciated her thoughts on seeking community even in transitory states of life. I consider myself a fairly capable reade A BenOp book with nary a “head for the hills” vibe. It’s much less about escaping than it is about the value (and how-tos) of Christians being meaningfully present to one another on a day to day basis. Great ideas, not immediately applicable to the area where I live and the age group, but the basic ideas are good. Also, not sure why she included non-Christians as I thought the plan was to preserve the faith through the moral darkness we are currently enduring, as St. Benedict did in the 6th century. Still, I do have some ideas and also either confirmation that the problems I’ve experienced with past groups were not uncommon as well as ideas for how to fix them. Good practical book on living the Benedict Option and intentional Christian community. Great practical ideas I will use. NOTE: This book is based off "The Benedict Option" by Rod Dreher, which I have not read. I don't think you have to read that book to appreciate this one. I found this book very relatable and balanced, not about retreating from the world, as come critics claim of Dreher's book. I've been reading several hospitality books recently, and I finally stumbled across a Catholic one! For the first 2/3 of this book, I found myself saying "Yes" over and over. Some of the issues she discusses are th NOTE: This book is based off "The Benedict Option" by Rod Dreher, which I have not read. I don't think you have to read that book to appreciate this one. I found this book very relatable and balanced, not about retreating from the world, as come critics claim of Dreher's book. I've been reading several hospitality books recently, and I finally stumbled across a Catholic one! For the first 2/3 of this book, I found myself saying "Yes" over and over. Some of the issues she discusses are the exact problems I found myself facing (how do you get people to come?!). I felt like I had come home and found someone who gets it. I can't recommend this book highly enough to others. Minus 1/2 star because the last 1/3 of the book got a little murky for me. I think it was theologically sound, but it opened itself to misinterpretations. There were also hints of intellectual elitism. This is probably due to the author (a recent convert to Catholicism from atheism) still being a baby Catholic. She still has a bit of her old atheist mindsets and habits. And I found that I had trouble relating to her personality (very quirky), which came out more at the end. Apparently, she has a blog. :-/ It seems like she reverted to "blogger writing" (not as high caliber as normal book writing) to fill out the book. But she is on the right path and time will deepen her faith and experience of Catholic life. I would read future books by this author. This book has a lot to offer recent college graduates, who are just starting out. She makes references to not having stable employment, housing or funds but still wanting/needing community. Some of her ideas are geared toward that lifestyle - mobile, technologically connected, limited money, potential to gather lots of friends and host huge events. I loved the idea of storge (affection that comes from seeing someone repeatedly) and beguinages (old world European women who banded together, essentially forming lay convents, where they lived in small groups and experienced an intensely shared christian prayerlife). I liked the ideas of a spontaneous bookclub - single events planned around a particular book. Sometimes with only two people! Sometimes with a whole group. Her chapters titled "cheat sheet for x" lack specific detail. But they did have some good general tips. Like using casseroles or cold food (J: or crockpots) for crowds, nothing that requires a lot of work and attention at the end while guests are arriving. I also liked her idea of purposely not setting out enough chairs (keeping some folding chairs in a nearby closet), so that first arrivers don't rattle around too much empty space. (J: And if the event ends up smaller than planned, no on is the wiser.) I don't know if I'd be brave enough to not have the house totally set up but I see the merits of that plan. She talked about how she likes to provide food for her guests, which I appreciated. No potlucks! But she was relaxed in other ways. She uses electronic invites and encourages friends to invite other friends. She talks extensively about her anxiety praying in public, especially saying grace in restaurants. Being raised in Catholic circles, I had trouble connecting with this. Small prayers in public felt like an aggressive act to her, but they are a normal part of life to me. If someone is deeply offended/violated by seeing you make the sign of the cross at another table, that speaks to their own issues. She also made a comment about how Catholics came out of the woodwork and went crazy when Pope Francis visited - publicly identifying themselves. I don't even remember a recent US papal visit. I think the intellectual elite that surround the author in NYC behave differently than my mid-western catholic friends. Oh my goodness! This woman has an amazing social life and no fear about planning social events. I was impressed. The first 2/3 of the book are worth re-reading periodically over the years. 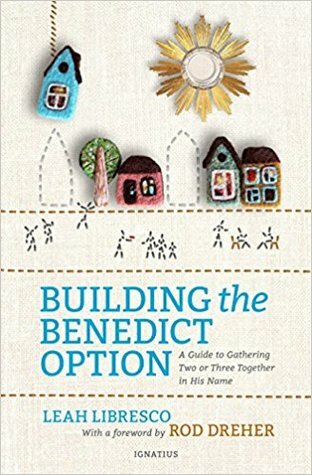 In August, Ignatius Press released Building the Benedict Option: A Guide to Gathering Two or Three in His Name by Leah Libresco. In 163 pages, Libresco takes the reader through her vision, experience and practical tips for making the Benedict Option within reach. Citing smart authors with smart words in lucid language Libresco makes the case that the concept is better understood as not a call to withdraw out of our physical communities but to go deeper spiritually wherever we are, to recognize t In August, Ignatius Press released Building the Benedict Option: A Guide to Gathering Two or Three in His Name by Leah Libresco. In 163 pages, Libresco takes the reader through her vision, experience and practical tips for making the Benedict Option within reach. Citing smart authors with smart words in lucid language Libresco makes the case that the concept is better understood as not a call to withdraw out of our physical communities but to go deeper spiritually wherever we are, to recognize that this environment will not give us what we need, so we must intentionally seek it. We learn as we turn the pages that the Benedict Option concept ignited a fire in her extroverted heart to deepen the activities she had already begun. Libresco walks us through the maze of the problem solving she undertook to improve her gatherings. In eleven chapters, she begins with “Accidental Stylites” an introductory essay to her passion and role in this project. Chapter 2, “Enemies of the Benedict Option” is not about the criticism thrown at Rod Dreher over the years but rather the functional, social and spiritual obstacles to building community (loneliness, seeing marriage as the end-all-be-all of relationships, instability, lack of time). In Chapter 3, “The Beginning of My Benedict Option” Libresco shares more of her personal story, gathering people together to learn what they’re needs are (the answer: surprisingly small). Chapter 4 “The Little Way of Hospitality” brings together the ideas of hosting with Therese’s Little Way of Love. Small, intentional acts of kindness serve the Lord and others. “Go and Do Likewise” in Chapter 5 are her very practical tips on how to make hosting large groups work for you, breaking down the expectations that I must cook ornate meals and serve in Pinterest-worthy plates. Chapter 6, “Doing Together What You Do Alone” pinpoints the way to discern what type of gathering you might consider. Examples include a hymn sing when you never get to hear your favorite hymn sung in a group or proofreading cover letters. Chapter 7 continues the theme with “Doing Publicly What You Do Privately” by having events organized for the purpose of prayer, or making an effort to pray with people when you might have done it alone. Chapter 8, “Home as a Center of Gravity” reminds us that third places, public places where people gather cannot really compare to letting people into your life at home. Chapter 9, “Welcoming the Stranger” addresses the practical issues of including people who are new to the group and troubleshooting problematic guests. “She Looks Well to the Ways of Her”, Chapter 10, bring us back to her cheat sheet making for a well-rounded list of tips on how to pull off these gatherings with modern advice like using doodle.com and Facebook events. In the final chapter “Returning to God” Libresco ends her work like she ends her party, in prayer, recalling Christ and what makes building Christian community different than the basic need we all have to build community. This and the first chapter read like very lengthy essays while the chapter between them hold a more defined and pragmatic focus. It is fitting that the forward by Rod Dreher waxes poetic about the author because by the end one feels they have encountered Libresco personally. And she seems delightful. I have a feeling she is one of those individuals with a magnetism that draws people to her, the “instant cool” even if she might be dorky (I can say this because her idea of a holding a party to read Shakespeare sounds amazing). Not every possesses this quality and the coolest cats with it have no idea how powerful their presence is. People are drawn to them. May be helpful for those who are already attracted to the idea of hosting medium to large size gatherings, but it is unconvincing for the reader not already inclined to do so. Libresco touches on quite a few topics with efficiency, but not deeply. She is obviously well-researched but it seems like Building the Benedict Option, perhaps due to its relative brevity, does not share the fruits of that research. Her thoughts on hospitality and its benefits for both host and guest are well constructed, May be helpful for those who are already attracted to the idea of hosting medium to large size gatherings, but it is unconvincing for the reader not already inclined to do so. Libresco touches on quite a few topics with efficiency, but not deeply. She is obviously well-researched but it seems like Building the Benedict Option, perhaps due to its relative brevity, does not share the fruits of that research. This book had some good ideas for building Christian community but it seemed like it was geared towards extroverts without small children. As an introvert with a small child I found it difficult to find the suggestions (many of which involved hosting large social gatherings) applicable to my temperament/life situation. This book does expand on the ideas of the Benedict Option, but mostly for young adults or those just starting family. I would love to see a revised edition in 10 years with ideas that would include lots of children. Going into this book, I was very skeptical of the Benedict Option. Leah Libresco did a great job of helping me realize that I was misunderstanding what the Benedict Option is, and how I can better incorporate the charism of hospitality into my life. A solid book that goes hand-in-hand with The Benedict Option: A Strategy for Christians in a Post-Christian Nation. This book is very clear and occasionally helpful, but I'm really not the right reader for it. I lack too many of Libresco's cultural touchstones and religious commitments. But I would buy this in a heartbeat for a 20- or 30-something nerdy Catholic without children living in a big city. A really helpful book for seeing church as community. I am not Roman Catholic, so there was some sifting of principles for me but I'm very glad I found this book and I have passed it to others. A well written and resonate book on the topic of creating real community in the here and now. Some interesting ideas here. Would be good for a study group. We are preparing to begin a small group / dinner group in our home soon, hoping to live out Acts 2:42 and build community. This book is excellent heart and practical preparation. After reading an awful lot of books, years of late-night debates (the kinds that tended to include sentences like “Ok, imagine for the moment that God is a cylinder…”), and a fair amount of blogging, I was surprised but pl I grew up as an atheist on Long Island. When I went to college, I picked fights with the most interesting wrong people I could find — which turned out to be the campus Catholics.